Believe it or not but 101 countries in, 709 cities and towns backpacked through on my journeys yet Madrid in Spain had somehow escaped me until 2015. Along with my time in Rome (Italy), it seemed that two of Europe’s most famous cities had failed to entice me thus far. But after my Tunisian and Algerian adventure, I headed back to Spain for the second time in the last year (proximity to Algiers helped). 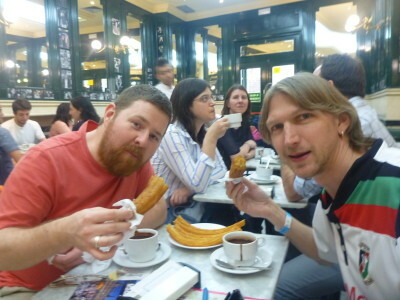 I decided to head to the capital city of Madrid for a few days after my adventure in the Basque Country. When you look online at hostels in Madrid, far too many come up, so you have to make a quick decision on which one to stay in before you get immersed and waste time studying the various hostels scattered all over the city. For me it was a no-brainer. 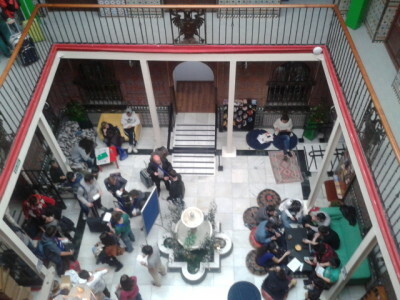 I wanted to stay in the craziest, most popular and oldest hostel in Madrid. 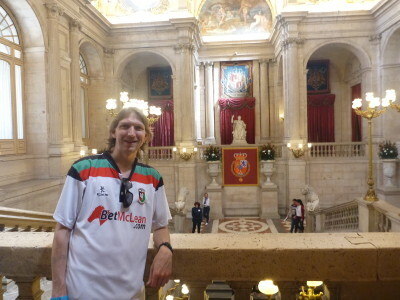 I booked a few nights in Cat’s Hostel and arrived by bus from the northern Basque city of Bilbao (itself a gem). Even better is that Cat’s Hostel is included in the list of Europe’s Famous Hostels, so there was that added prestige here. 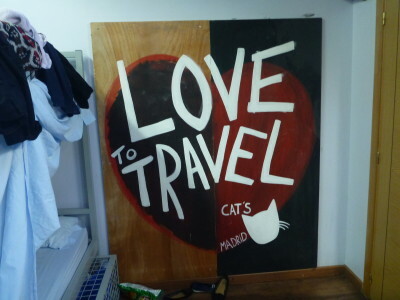 Here are five reasons why I loved my time in Cat’s and why I believe that either Cat’s Hostel (or the equally cool Mad Hostel) are the places to stay when backpacking in Madrid, Spain. 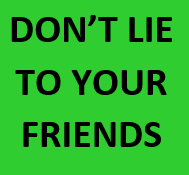 Cat’s Hostel is an awesome place to meet new people as quite simply it is a proper party hostel. Old school party hostel – social life unrivalled. Reminders of my days backpacking in NYC, Prague, Rotorua and Sydney came reeling back when I arrived in Cat’s Hostel. Partying with the crowd from Cat’s Hostel in Madrid. 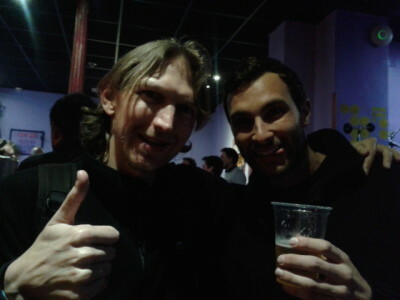 I met lots of new people – Andy, Marco, John, Olga and Pawel. I partied in the cool bar at Cat’s, I headed out to a few bars and I generally had a great time, warping myself back to my early backpacking days again. Though admittedly I no longer party until 3 or 4 am. 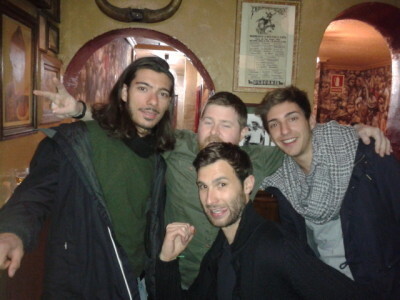 Earlier nights were needed in Madrid to explore the city but the young ones were all night! 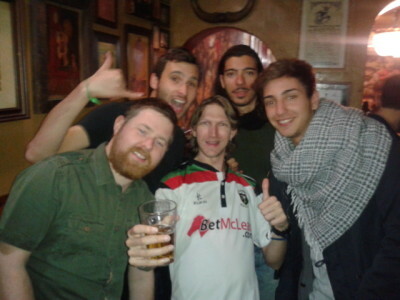 Pub crawls are organised nightly by the staff here at Cat’s, some of them including entry to some of Madrid’s best nightclubs. 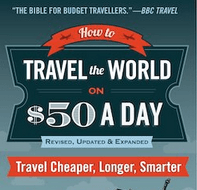 I love the fact that hostels and backpacking in Spain is still a relatively new phenomenon. 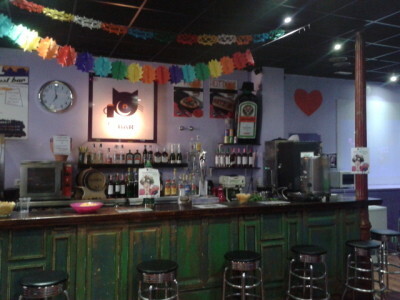 I was surprised to learn that back in 2004, Cat’s was actually the first hostel in Madrid. 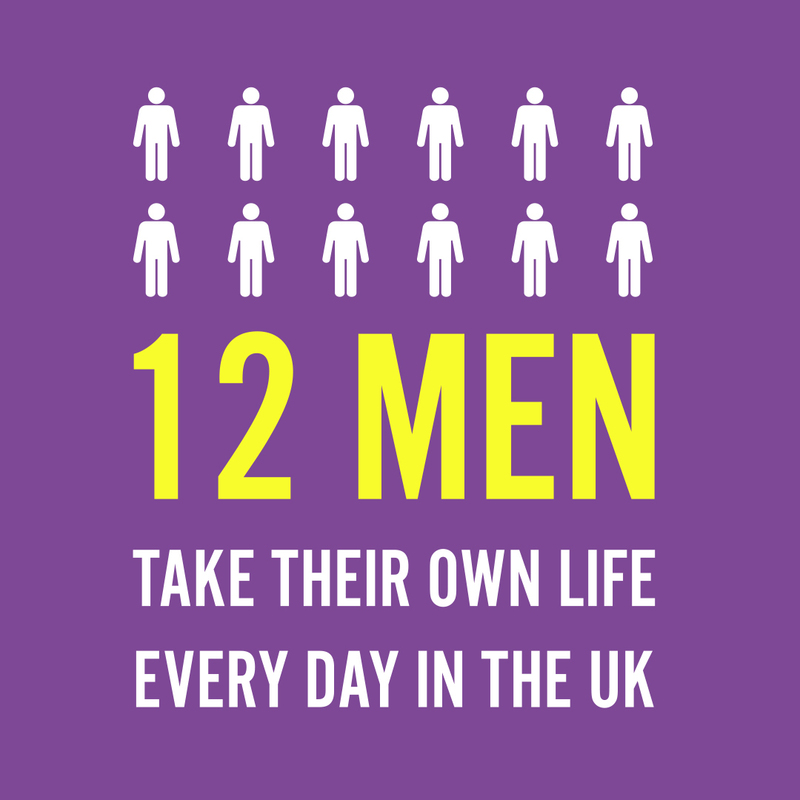 This gives it that step ahead of the others. It was here first, it knows the score and it caters for backpackers of all types. I stayed in a massive 19 bed dorm and loved it! When you first step into Cat’s you are unaware that inside lurks a special vintage courtyard. Head through the doors to reveal a red, stylish courtyard with an air of ambience about it. This courtyard is epic and dates back to the 17th century. 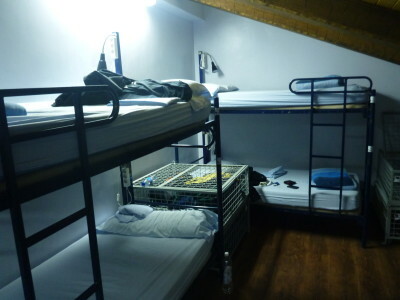 It reminded me of some of the other hostels I had stayed in before such as the Loki Hostel in La Paz (Bolivia) and the Silk Road Hotel in Yazd (Iran). I chilled out in the courtyard and got some work done. The internet wasn’t as fast as I had hoped but when you have a couple of hundred backpackers here flashing their phones and laptops, then you can understand. Wi-fi is free none the less! I’ve said before that staff help make a hostel. Greeted with a warm smile, handed a map with my key and given an overview of the hostels events on arrival. I hung out with some of the staff for a couple of nights including barman John from Liverpool and Marco who organises the nightly pub crawls as well as overseeing the best of what happens in Cat’s. The thing about Madrid is, it’s an easy city to navigate above ground. If you stay in Cat’s Hostel, there is actually no need to take the Metro or buses anywhere. Aside from the three football stadiums, you can walk everywhere from here, as I did. The Plaza Major, the Palacio Real, the Museo del Prado are all close by and you can get happily lost in the glorious range of bars and cafes nearby including the oldest restaurant in the world, Restaurante Sobrino de Botin on Calle de Los Cuchilleros. 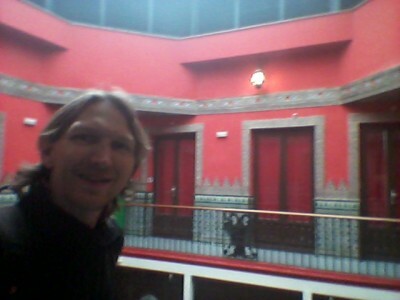 All in all my time in Madrid was made even better by my choice of hostel. Just to add that each bed has lockers just make sure you bring your own lock (as I always do) and a €10 deposit for the key. Oh and breakfast is free!! (nearest Metro stations Anton Martin and Tirso de Molina are within 5 minutes walk). 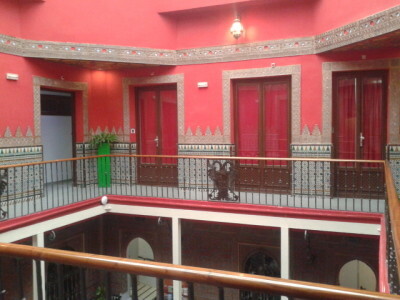 This entry was posted in Accommodation, Europe, Hostels, Madrid, Spain. Bookmark the permalink. Ele recently posted…“Maro Diena”: literatūrinė provokacija ir propaganda apie Kauną ir ne tik. Interesting you say Cat’s was the first hostel in Madrid in 2004, I am 99% sure I stayed in a hostel in 2002 prior to the NI game in Albacete, Hostal Florinda. A certain Stephen Rowley stayed in the same place, so I am close to 100% certain it was a hostel. 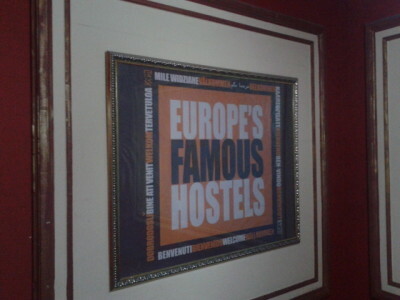 But then again you know the score, cheap hotels get called hostels depending on the site you visit. 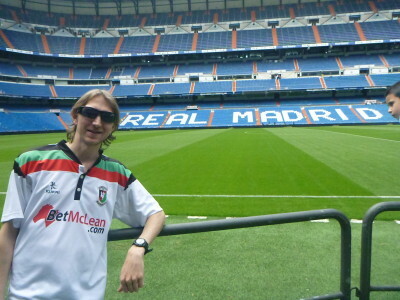 Never warmed to Madrid when I was there, but again I was the tender age of 20 and was more interested in riding and boozing, so the going to actually see things was away down my list. Might give it another go some day.